Is this normal from 100-17 in 4,5 hours? I recently bought this used nokia 8 phone. Over 2 days since you charged it and over 4 hours SOT is far from mediocre but as there appears to be no SIM in the phone it is hard to tell if these number hold up as it will not have been searching for a network. Also Depends on what you are doing with the phone during the SOT and how bright the screen is. It's hard to compare as not every bodies conditions are the same. 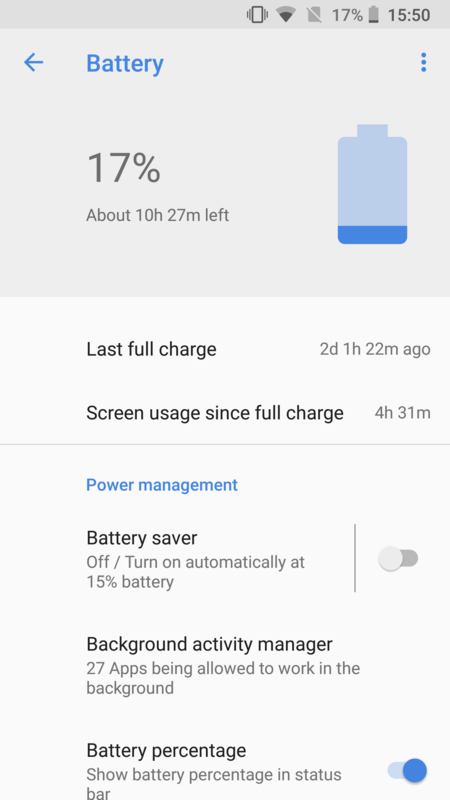 I’ve had my phone running with Battery Saver onbecause I thought it wasn’t lasting long enough, but having switched that off I’m getting the same battery usage as I did with Oreo.